Affidea Group is a leading health care services provider with over 7500 professionals performing almost 13 million examinations each year. Affidea is recognised for its superior medical technology platform, scale efficiencies, internationally awarded medical excellence and its continued expansion into new ways to create value as an integrator provider for healthcare stakeholders. Amsterdam, May 2nd 2018: Affidea Group, the leading European provider of diagnostic imaging, outpatient and cancer care services is pleased to announce the successful acquisition of IMI - Imagens Médicas Integradas - an important provider of diagnostic imaging and teleradiology services in Portugal. The recent acquisition is part of Affidea's strategy to expand its core services of diagnostic imaging while adding new capabilities in teleradiology. This will strengthen the company's position as a healthcare innovator driven by high technology, clinical excellence and results driven processes. Commenting on the acquisition, Giuseppe Recchi, Affidea Group CEO, said: "IMI's acquisition in Portugal is an important milestone in Affidea's story of growth, proving our commitment to strengthen our leadership position in advanced diagnostic imaging and our interest in building a digital platform with additional services like teleradiology. Affidea is a company with an ambition for both organic and acquisitive growth. In the last year alone we have added 77 new centers across our European network. Leveraging our core competencies, we will continue to invest in the healthcare industry, expand geographically and create value through digital and data driven adjacencies. The scale of our network, our digital and hi-tech capabilities as well as our clinical excellence - awarded by international medical and academic institutions - make us the preferred provider for healthcare stakeholders from PHIs, doctors and patients to the NHS. As a leading medical provider, we aim to improve the healthcare ecosystem and contribute to creating a healthier society having a solid foundation through medical excellence, standardized medical protocols along with an outstanding customer experience in all of our markets". Through this acquisition, Affidea's European network has grown to 245 centres in Europe, with over 7500 professionals performing almost 13 million examinations and serving more than 6.5 million patients every year. In Portugal, Affidea has expanded its footprint to 21 centres and added teleradiology services to its portfolio. Thanks to the recent IMI acquisition, Affidea Portugal will provide over 1.4 million examinations per year for patients all over the country. Affidea (www.affidea.com) is the leading European provider of diagnostic imaging, outpatient and cancer care services, operating in 16 countries across Europe, with a focus on delivering timely, thorough diagnostics and high quality treatments by working only with state-of-the-art technology and experienced medical professionals. The Affidea Group employs over 7500 professionals and operates over 1300 diagnosis and cancer care modalities with almost 13 million diagnostic examinations every year. Affidea is owned by interests associated with the Bertarelli family which are advised by their business entreprise, Waypoint Capital (www.waypointcapital.net). 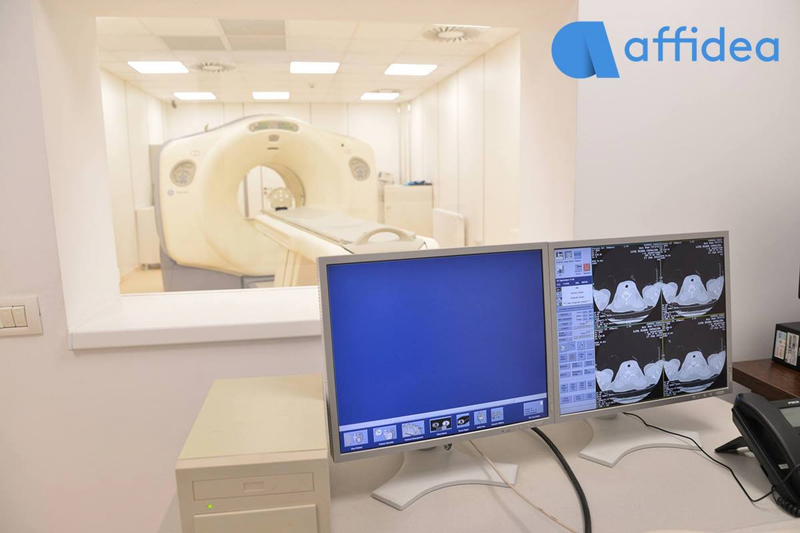 Affidea is a leading provider on the healthcare market in Portugal with 11 stand alone centers of diagnostic imaging and medical consultations plus 4 clinical laboratories, which cover more than 300 blood collection points. Affidea provides more than 575.000 imaging examinations and 6 million blood analyses results per year for patients all over the country. IMI- Imagens Médicas Integradas is an important diagnostic imaging provider in Portugal with a history of over 30 years in the local market, operating 4 stand-alone diagnostic imaging centres, including a flagship centre in Lisbon, and manages medical imaging departments for 6 private and public hospitals. Furthermore, IMI provides teleradiology services and operates blood collection points in its Stand-alone centres.